Two new Genie® Z®-60/37 FE (fuel electric) hybrid booms are proving to be a winning investment for Western Sydney-based Camden Hire, which leases earthmovers, trucks, lighting, party hire and compaction equipment in addition to its EWP fleet. 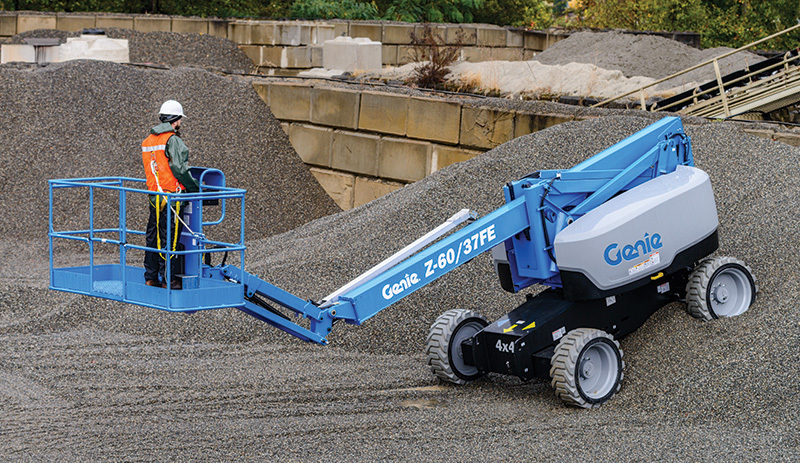 The Genie® Z®-60/37 FE model climbs 25% faster than a typical diesel-powered unit, and according to Adam Mulley, Branch Manager – Access Hire Division, Camden Hire, the hybrids have already achieved permanent rental status indefinitely thanks to the strength of Sydney’s construction sector. “The building industry in southwestern Sydney is booming,” Adam says. “We are surrounded by many prime residential and industrial developments.” There will also be plenty of opportunities for our clients to use a Genie Z-60/37 FE hybrid boom when construction at Badgerys Creek Airport clicks into gear, noted Adam. Several features of the new boom caught the eye of the Camden Hire executive. “The stability of this hybrid is quite good, as well as the smoothness of the operating system while you’re up in the air,” he commented. Adam, whose firm services a broad range of clients across the Greater Sydney Basin, believes the Genie Z-60/37 FE hybrid boom will have many useful applications. “It will be especially handy for projects in schools and universities,” he said. “With the electric motors, these machines are very quiet. Apart from the secondary and tertiary education sectors, Adam believes the hybrid booms will be used for maintenance work, as well as by electricians, cleaners, sign writers and other tradespeople. Camden Hire, which launched in 1984, has a long history of doing business with Genie, which is celebrating 21 years servicing the EWP industry in Australia and New Zealand in 2018. “We keep going back to buy Genie products because they are reliable. The machines rarely have an issue.